The presentation in the mezzanine of the Museum Frieder Burda shows around 20 collages by the American artist Ray Johnson (1927-1995). 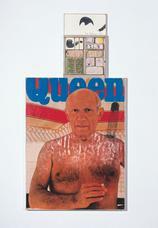 As a forerunner of pop art, his enchanting works are still little known to a wider audience, and within the art scene, this founder, the founder of Mail Art, enjoys the reputation of a legendary outsider. After completing his studies at the famous avant-garde Black Mountain College in North Carolina Johnson went to New York in 1948 and began, based on the Dadaist collage, his playful moticosto develop small-format collages in which he uses delicate drawings, newspaper and magazine clippings, advertisements, brand logos and random elements to play through formal abstraction processes and to condense them into bizarre material prejudices. By making use of the American mass media and being inspired by popular culture in the early 1950s, he is one step ahead of pop-art heroes such as Andy Warhol, Jasper Johns and Robert Rauschenberg with wit and verve. The exhibited works are from the collection of the Frieder Burda Collection and the Ray Johnson Estate in New York. This cabinet exhibition continues the concept of presenting solitaires from the Frieder Burda Collection in changing presentations over and over again in a differentiated way. Thus, the mezzanine in the heart of the house is a place of vivid contemplation and exploration, in which the visitor can immerse himself in the rich diversity of the collection.